The motivation behind my decision to read this book came from a discussion I overheard two years ago between a group of orthodox Muslims and a Christian, all appearing to be males from the African diaspora. The only reason I heard part of their conversation (which dealt with similarities and differences between Christianity and orthodox Islam) was due to a mis-read on my part (I thought the group of brothas were freestyling so I got in the huddle to listen and hopefully spit a little something something myself, lol). After telling a friend of mine about the encounter and how it got me interested in the differences between Christianity and Islam, he (who is also a Christian) told me that it is believed that both religions emerged from Abraham's offspring: Christianity stemming from Isaac and orthodox Islam stemming from Ishmael. This resulted in me copping Bruce Feiler's "Abraham: A Journey to the Heart of Three Faiths" (2002) when I came across it at a book store shortly after. The basic premise of the book is that three of the world's major religions, Christianity, Islam, and Judaism, stem from Abraham's offspring: Islam from Ishmael, and Christianity and Judaism from Isaac. 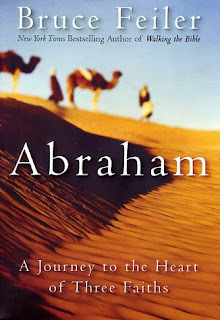 Further, Feiler (2002) argues that some (or many) of the major similarities and differences between these three religions are reflected in their depictions of Abraham's life. For instance, one of the things I found striking is that whereas the Bible's depiction of Abraham focuses on his "adult" life, the Koran's depiction of Abraham, according to Feiler, contains sufficient information about his life as a child. Another example lies in way in which Feiler suggests that how each religion views Abraham's relationship with God sheds light on how that religion views the role of humans in relation to God. The bible's telling of Abraham's life stresses his enormous faith in God, whereas the Torah and Koran's telling of Abraham's life emphasizes Abraham's submission and obedience to one God. "You could not have written a script that would say that today, after thousands of years, with all our technology and sophistication, we would still be fighting a war over this place (Jerusalem), over the legacy of Abraham. But the reason is that this is the place of relationship. This is not only the spot where it is possible to connect with God, it's the spot where you can connect with God only if you understand what it means to connect with one another. The relationship between a person and another human being is what creates and allows for a relationship with God. If you're not capable of living with each other and getting along with each other, then you're not capable of having a relationship with God. So the question is not whether God can bring peace into the world. The question is: Can we?"